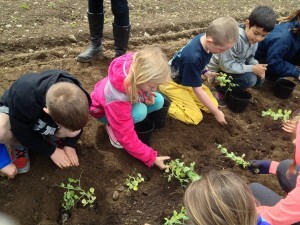 Hundreds of eager elementary school students are back at our partner farms this spring. For Wilkes Elementary students, the visits mean an easy walk from school to Historic Suyematsu & Bentryn Family Farms on Day Road. 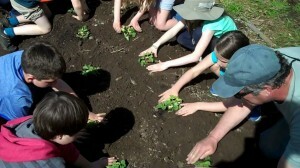 A 3rd grade class from Wilkes Elementary transplants sugar snap peas. Over 250 Wilkes students from 1st through 4th grades are visiting the farms to study both strawberries and greens. Check out Mrs. Spickard’s website blog about her 2nd graders at the farm! EduCulture is excited to announce the launching of the Island Heritage Strawberry Project at Suyematsu, where students are repatriating the historic Marshall Strawberry and planting other varieties that through the decades have been popular production strawberries on Bainbridge Island. William Covert’s 4th graders were the first class to plant Marshalls at Historic Suyematsu Farm this spring on land leased by Butler Green Farms. The strawberry that once defined Bainbridge Island is now an endangered species. The Marshall strawberry was the “finest eating strawberry in America,” and was grown extensively on Bainbridge Island, where it thrived. During harvest, 500 fifty-gallon barrels of Marshall strawberries were shipped off the island daily. After WWII, if was ravaged by viruses introduced from abroad and was cut from commercial production, almost vanishing completely. Today, small pockets around the country are working to save the strawberry, an original in an industry that has bred the flavor and juiciness out of the berries we see in our stores. On their recent visits, Wilkes students and their teachers helped to plant the Marshalls, along with other berry varieties such as Shuksans, Rainiers, and the Marshall and Ever Bearing Mix. Part of the Heritage Project will include Island elders assisting in the cultivation and harvest of the Marshalls, which many helped their families grow on local farms prior to WWII.